Chapter 1: Why Teach English in Korea? Teaching English in Korea ultimately became something that I never expected. Though in some ways I had an idea, so much of my time in Korea took me down other paths both in experiences and in personal development. It amazes me sometimes to see the volumes of videos and blogs online about Korea now. Only a few short years ago the videos on YouTube were limited to about a half dozen channels that put out consistent, useful content. I remember trying to find apartment tour videos wishing there were more. How things have changed. Being a textbook type-A personality, I scoured all the information that was online hoping to learn what Korea life was going to be like and if I was crazy for leaving my old life behind. I eventually reached a saturation point where I was unable to find untapped videos and blogs about Korea. I came to the realization that I needed to stop fantasizing and just decide whether or not I had the guts to put my life on its ear. In the beginning, coming to South Korea to teach ESL through their public school program was a little bit of many things to me. It is safe to say that after four and a half years of being in Korea, all of those musings were addressed. My life, however, has morphed into something completely unexpected and the future now looks entirely different than I ever thought it would be. All those days of toiling over videos and blog posts were ultimately in vain. In essence, YouTube videos and blogs are a bit like movie trailers. They give a bit of a surface teaser, but once you watch the movie you look back and realize how much hidden information there really was. I guess that is the purpose of a trailer; to get you to go see the movie. “Teaching ESL is a way to visit another country”. This is a reason why many people travel to a place like Korea. After that is a myriad of things. I have observed and learned that the reasons also include saving money or paying off debts, meeting someone for dating or marriage, and having something to do post-university graduation. People do it for a year or two and then move on to take care of life and business back home. For me there were a bunch of semi-reasons for coming to Korea, but the one that was most prominent was using it as a way to exit the IT industry indefinitely. I knew early on that there were many directions I could take with teaching ESL abroad if I wanted to make it a long-term endeavor. I just had to make it happen. I obtained multiple certifications including a state teaching license. I made valuable connections with many teachers in Korea which will serve as important references in the future. I heard it said before by someone famous, “Once you’ve experienced being hungry, you’ll never be full”. I had been through so many years of drudgery in the corporate world. I decided that if there were tasks that I needed to execute to prolong and flourish in teaching abroad, I would do them tirelessly. I completed many of those tasks, but I also continue to look for other ways to broaden my own horizons with teaching overseas. As for you, this anomaly of an endeavor called “teaching English in Korea” will be a reflection of you. Your motives for going will in due course become a friend or an enemy once you are in the thick of things. The way you view other cultures with regards to yourself will manifest sooner or later. Some people have amazing times in Korea; others hate it (with a capital H). And then there is everyone in between. Where you fall on the scale is entirely up to you. This is the truth. Do not let anyone in an ESL forum, Facebook wall, or YouTube video tell you otherwise. 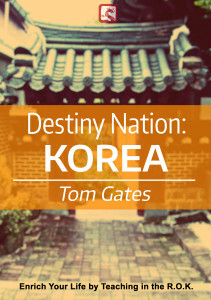 Your experience in Korea is going to be different than what you are thinking as you read this. You may encounter some of the horror stories you heard about. Conversely, you could get a great apartment, meet other cool foreigners from around the world, find the humor and irony in Korean culture and the people, become addicted to the food, and make the time count. Or, it could be a little bit of both as in my case. I made the most of my circumstances because in my life I learned that no matter how dreamy or vial a situation is, it is going to change. After all is said and done, your mind will remember the good points with more emotion than it will the bad points. A very wise man once told that there are three types of people in the world; those who can count, and those who can’t. My point is this, keep count of the good things, not the bad things, and own your ESL adventure. It’s only one year. You can view the complete table of contents here. Thank you. Yes, those who can’t! I like this a lot! Excited to read the rest! Thank you. Please do leave a review on Amazon when you’re finished. I’m always interested to hear people’s opinions.